When a friend first showed me this new-fangled thing called the Internet back in 1994, I immediately knew it would change everything. And as someone who shortly after that started a company that helped businesses and organizations leverage that power, I've been talking (and writing) about how it is changing the relationship between companies and anyone who does business with them, ever since. Of course, that change goes beyond just customers. It extends to include vendors, suppliers, partners, media and the community. We've also included employees in that group, but I don't ever recall writing a blog about how this technology changes that relationship. So when TDS Metrocom invited me to Madison to show me how what they're doing in the area of connected workplaces is as big a game changer as anything else that has happened on the web since its beginning, I was fascinated enough to give up a day in my own office to see what the fuss was about. In the interest of total disclosure, I've gotten to know a few local TDS salespeople from networking events, and a few years ago, even won a Vegas vacation from them when they drew my business card in a drawing at the local BizTimes BizTech Expo. Shortly after that, I was invited to do a Social Media presentation to their team. But quite honestly, I never REALLY knew what it was they did. I knew it had something to do with data, communications, and businesses. I also knew they had a data center where they hosted web servers. But beyond that, I was clueless. The day tagged as a "blogger event" began with discussions among several of the Midwest's respected and visionary bloggers, causing me to ask the most obvious question: "how did *I* get invited?" The theme was "The Connected Workplace," and began with a discussion about how a growing number of companies are using Facetime, Google Hangouts and Skype to facilitate face to face communications and even staff meetings. 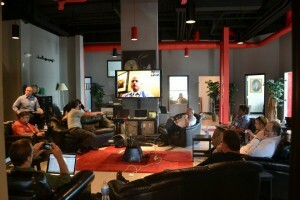 One of the first sessions even used the technology to video conference in the speaker. As the technology becomes easier and more ubiquitous, it is possible for team members miles, states and even countries apart to stay and feel connected. Telephone and data systems that run on the web offer the appearance that everyone is together, regardless of how apart they really are, make it almost ridiculous to NOT use. "Short sell commercial Real Estate." He talked about how big offices that congest freeways, cost hours of commute time and decrease the number of productive hours are going the way of the dinosaur. The trend to replace a workplace that everyone "goes to" with digital connections that allow the workplace to be wherever you are is the situation that he admitted he's been waiting for for 20 years. His thoughts resonated with me, as a digital experience that "comes to you with what you need when you need it" was my theme of a recent blog about mobile. It now extends to our jobs. Early in the day, I realized that TDS Metrocom sells phone systems. The difference with their product is that instead of a bunch of hardware in a closet, the stuff that runs their phone systems is hosted at a remote...and pretty amazing...data center. But as the day progressed, I realized that the even bigger difference is that they understand that they really are in the business of using Internet technology to connect people, build relationships and conduct business. Pretty much the same thing Trivera does. Unlike my space, where the devices have been computers and laptops, their devices have been office phones. But, in today's rapidly converging connected world, we're also both using mobile, online video, hosted applications and API's. My biggest takeaway was the fact that when my first exposure to the Internet convinced me that it would change everything, I didn't realize how big "everything" really was. The growing challenge for companies large and small in this connected world is the total integration of all the internet has to offer into all aspects of their business: Sales, Marketing, Management, Human Resources, and Communication, and most importantly finding people with the technological expertise to perform that integration. Fortunately there are companies like TDS and Trivera who can take care of that. Photos of the TDS Blogger Event are posted on Pinterest.